What would Tom Brady order at Precinct 10? The grilled salmon at Precinct 10. A massive, stainless steel smoker that can hold 800 pounds of meat at a time -- brisket, pastrami, ribs, sausage -- is the centerpiece of Precinct 10’s kitchen. Not that the restaurant is a BBQ place -- it’s not. The family-friendly menu offers a large number of regional American favorites. Overseeing a group of chefs is owner Kevin Hynes, who was both a Weymouth police officer as well as a cook at the Red Coach Grill in Hingham years ago. Precinct 10 opened on New Years Day 2017, increasing Hynes’s roster of restaurants to four. They include Stockholders in Weymouth, Bay Pointe Waterfront in Quincy, and 42 Degrees North in Plymouth. 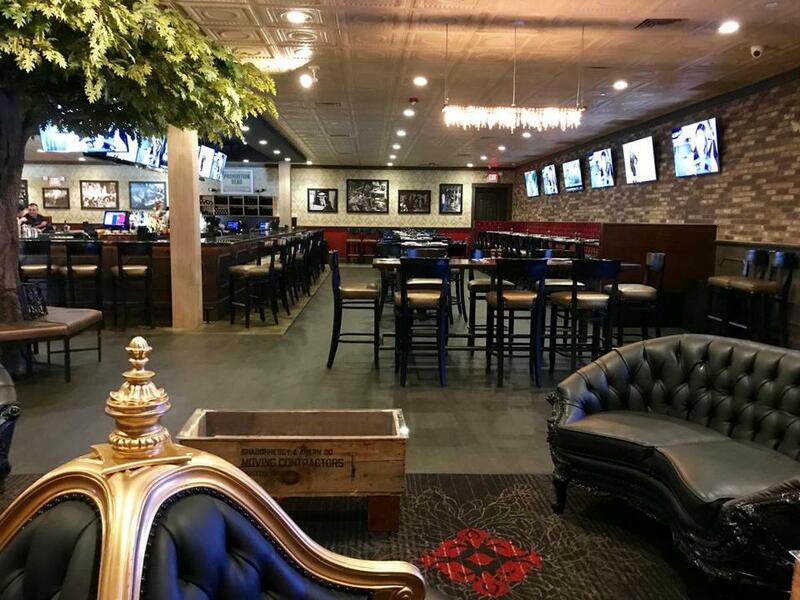 Located in a Weymouth strip mall, the 250-seat restaurant is a large space that makes up for what it lacks in windows with an abundance of TV screens (28, to be exact). Housed where the former Hilltop Butcher Shop used to be, the totally renovated space was fashioned after an old-time speakeasy. It’s dark with dark wood, red velvet booths, a tin ceiling, and glass chandeliers. A U-shaped bar accommodates 42. The adjacent lounge has black leather couches -- a comfy spot to have drinks -- and a half-wall divides the bar and lounge from a dining area. Precinct 10’s bar and lounge area. The menu is big, so everybody should be able to find something to like. Fish? There’s a New England fried platter, San Francisco cioppino, ceviche tacos, paella, truffalo shrimp. Missing New Orleans? Have a muffuletta. Missing mom? How about some meatloaf, mac & cheese, or Southern fried chicken? There are also burgers, chops, pastas, salads, sandwiches, tater tot poutine, soups, and more. You do have to wonder, though, what Tom Brady would order. This is the kind of kitchen that hails from an older, more carefree time when people didn’t worry about using extra virgin olive oil, their cholesterol, or inflammation. So, bring on the house-smoked brisket sandwich ($13)! Served on a brioche with some great French fries, it’s covered with Swiss cheese, pickles, and red slaw. Following this dish, reverently remembering Tom, we try to order as healthfully as we can. 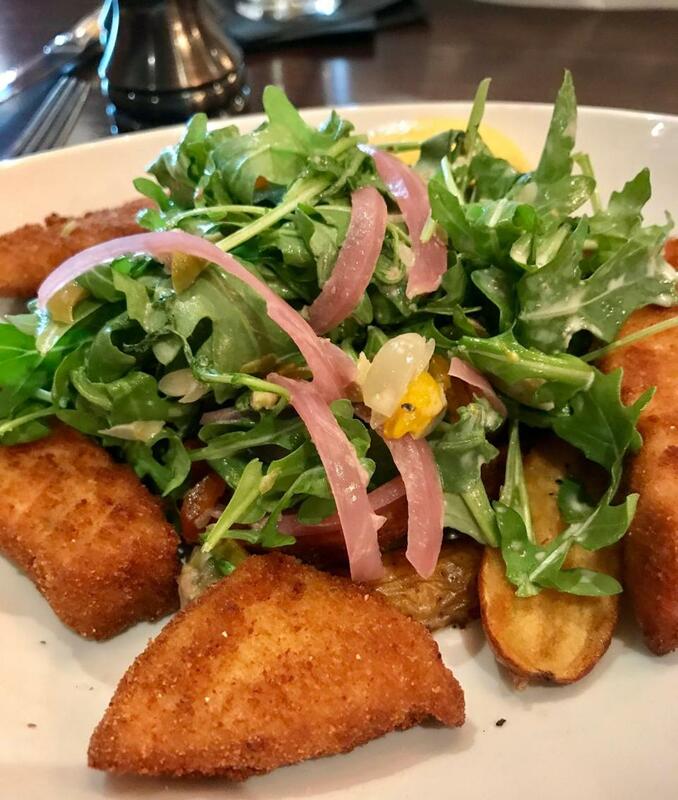 On three visits, the service is great and the kitchen obliging, so know that subbing in a whole food, like a baked potato instead of those fries, is always an option. The best dish I had is the grilled salmon ($12) on the lunch menu. 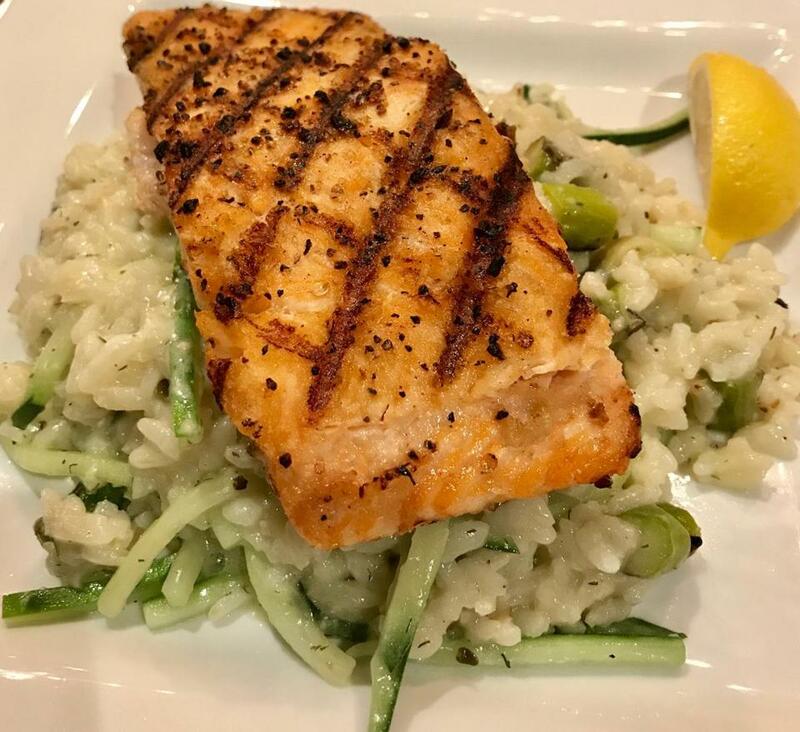 It’s a very large filet, cooked nicely and served over a creamy asparagus risotto that has nuggets of that vegetable and julienned zucchini. The mussels ($12), on one visit, are tiny and tasty in a mild white sauce. The cranberry beet salad ($12) is a very nice pile of lightly dressed arugula studded with red beets, avocado, red onions, and sunflower seeds. All the salads can be ordered with protein add-ons -- always a smart option. The spaghetti squash salad ($12) is a good dish. The squash is delicious atop a pile of arugula with cukes, red pepper, tomato, red onion, and olives. We order it with what is a very generous portion of added-on scallops ($8). They are perfectly, lightly grilled, but in some kind of commercial oil-butter mix that mars their sweet flavor. The swordfish nuggets ($16) are nicely pan-fried with a light breading, which we aren’t expecting. They taste much better than they look, though, and are served over an arugula salad with good, cold, baby Yukon Gold potatoes. At the end of one meal, when our friend orders the coconut cake ($8.50), really, who are we to refuse a bite? Not Tom Brady! Precinct 10, 110 Main St., Weymouth, 781-335-0010, precinct10restaurant.com. Joan Wilder can be reached at joan.wilder@gmail.com.